Well I got into a bit of a My Little Pony mood last night and well since I hadn't done it before I thought I'd use a lil bit of the styling to do up a new badge of Lig and also try out a simpler approach to things. All and all I'm quite happy with how this one turned out and thing Lig turned out pretty cute. ^^ Not sure if I'll be using the Poney line art style so frequently but I might try giving this style a bit more of a range and seeing what I can do with it. Now since this is a badge and there's not story I'll just do a lil character sheet for Lig. Medical Note: Due to undeveloped nerves Lig is incontinent and never really knows when he's gonna go. 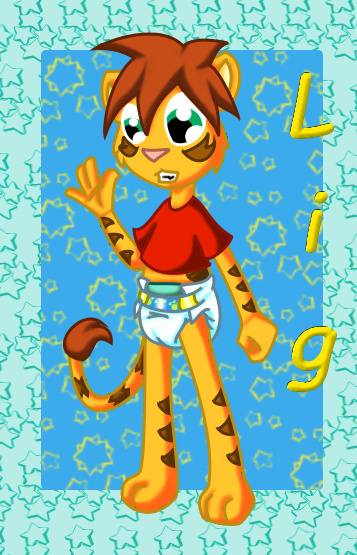 Bio: Lig is a happy out going kinda nerdy little Liger. Plays well with others and is a lil walking scifi encyclopedia. Lig lives with his big brother Warren whom he's quite close too and is his only surviving close family as their parents died in a car crash. Lig occasionally has nightmares about it still. Tries not to let it get him down and focus on the now. Beyond that Lig loves his diapers and has said he wouldn't potty train even if he could. To this end Lig has a gig as a Pawpers model and Spoke Cub. He also likes cubby stuff as well typically having a paci somewhere near and likes a bottle in the evening. Beyond that he's got a collection of stuffed animals of which his oldest and favorite is a stuffed Liger his mom made for him when he was little.